People need Hope. We needed it a year ago, when we were about to face what could be considered by all to be a true annus horribilis. 2013 brought out the worst and the best in us: our despair and our will to fight, our fear of the future and our solidarity, our terror of change and our ability to adapt and improve. But we also need hope because it seems that 2014 is looking to be a little less horribilis. Because if 2013 was a difficult year, it seems that 2014 looks to be full of a greater degree of hope and possibilities. After what we went through in 2012 and 2013, it seems hard to believe that things could get better, but it seems they will. That’s what we hope for, ask for, and wish. Last year, we had some “musical accompaniment” for our Happy New Year with a carol recorded by Alan Lomax on January 1, 1952 in Tolosa. We’re repeating again this year, at least the source of our greeting. Again, we’re turning to a sample of Alan Lomax’s work in recording the sounds of the Basque People (which you can find out more about here) to use yet another classic, Olentzaro. The image we’ve chosen is full of symbolism. 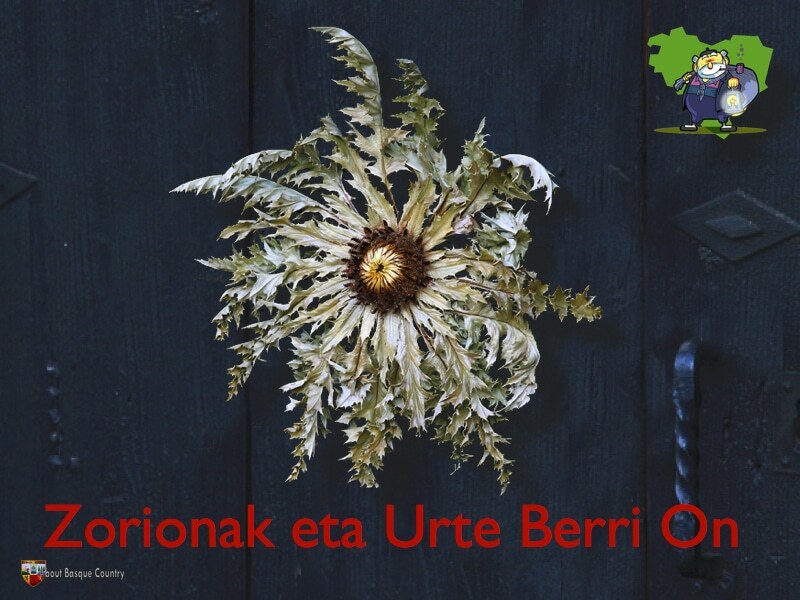 There’s a sunflower, eguzkilorea, on all our doors, the “doors of our Land”, that protects us from bad spirits, and an Olentzero that brings us the light we need to find the path to make 2014 a great year. To all, Zorionak eta Urte Berri On.